Properties in Wald average 4.6 out of 5 stars. 5 ***** (DTV) House, modern and comfortably furnished for up to 8 people. Property 4: 5 ***** (DTV) House, modern and comfortably furnished for up to 8 people. 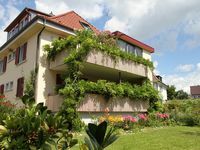 Property 12: Spacious bright apartment "zum Saibling"
Property 15: Apartment in the countryside and yet within walking distance to Ueberlingen. DG Apartment with fantastic lake and Alps. Property 19: DG Apartment with fantastic lake and Alps. Property 28: NEW! PURE RELAXATION! Holiday home: integrated into the nature with modern interior! 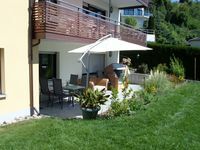 Property 42: Large apartment - close to the lake in Sipplingen- for you to feel good! Exclusive 5 ***** DTV apartment - 5 persons / 4 person & children & cots - Wohneinheit 3093839 Wohnung "Orchidee"
Property 46: Exclusive 5 ***** DTV apartment - 5 persons / 4 person & children & cots - Wohneinheit 3093839 Wohnung "Orchidee"
Wonderful apartment in a quiet yet accessable area. Perfect destination for a mom and kids weekend... Can't wait to return with my husband! Owner extremely friendly and helpful. The apartment has everything you need with so many extras. Cooking for us all was a pleasure as the kitchen had everything. 2 bedrooms that sleep 2 each and extra beds in the living room and dining room. Eat in kitchen is ok for 5, dining room has space for 6. Bath has a large shower and spacious. Small outside balcony has seating for 4 and is really peaceful.